Denon AVR-2310 review | What Hi-Fi? 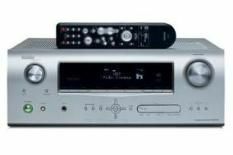 If you're concerned that buying an expensiive piece of kit like Denon's £1200 AVR-3310 might push your budget to breaking point, we suggest dropping down a rung and casting your eye over the £800 AVR-2310. You might be moving down a level, but don't feel shortchanged by what the '2310 has to offer. Power output from this seven-channel amp is 105W per channel, which may seem low compared to others, but bigger doesn't automatically mean better. The five HDMI inputs and one output are standard fare for this level of machine, as is the 1080p upscaling and built-in decoding of high-definition audio formats. Inside are two, 32-Bit, 3rd generation SHARC DSP's (Digital Signal Processors) and picture processing technology provided by Anchor Bay. The remote control looks a little strange with all the bumps and odd-shaped buttons, but they make it easier to operate, as you quickly remember which bump does which command. The ‘Source Select' button allows you to flick between inputs quickly and the amp remembers the most recent sources used. Power up the Denon and you soon realise that this is a real gem. It sounds like a more mature, dynamic and powerful version of its smaller sibling, the £450 AVR-1910. In X-Men Origins: Wolverine, as Logan tries to evade the helicopter gunship on his motorbike, the chopper's chain-gun mows through the forest with immense weight and power. You get a real sense of each tree being torn to shreds. With Pure Direct engaged and all unnecessary processing turned off, the amp sounds rich and smooth without ever suffocating the high frequencies. The Denon doesn't provide you with quite the same level of bass weight as the likes of some of its peers, but it's still ample and the quality is spot on. But it's in quieter scenes, where it has to work hard with subtle dynamic shifts, that the Denon earns its stripes. Once you've started a film, the '2310's timing and insight make it difficult to stop. It pays as much attention to the emotion of a film's soundtrack as it does to all the action scenes.